Parking is no problem at Flynn's. 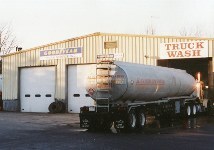 We can accommodate up to 100 trucks in and around the truck plaza. A nearby lot provides an additional 15 acres of parking, and trailer drop-off is visible from the plaza. Several transportation companies lease trailer drop space at our facilities because we are centrally located in New England. The droplot is secured, light and we will subdivide.